The XFI 3-Axis Accelerometer Module gives you the ability to read g-forces for acceleration/deceleration, vertical motion and turns. This module, designed to communicate with the C-Com XFI software, allows an individual to test and improve launches, braking and cornering of your vehicle. Possible uses for this are off-road, road racing, drag racing and even your street performance vehicle. 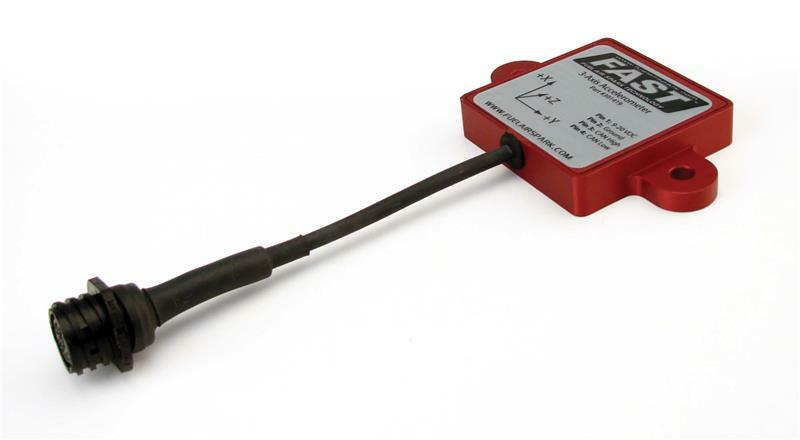 The accelerometer module measures and transmits G-force data from all three axes with a range of +/- 4g. The module transmits the data using the Controller Area Network (CAN) protocol at 500 kbps. Once transmitted, the data is available for viewing and logging through either the XFI or the FAST Dash Logger. The accelerometer module is shipped with the following items.